Lake Traverse Indian Reservation, South Dakota, U.S.
Cedars-Sinai Medical Center, Los Angeles, California, U.S.
Saint Matthew's Catholic Cemetery, Veblen, South Dakota, U.S.
Floyd Westerman, also known as Kanghi Duta i.e. 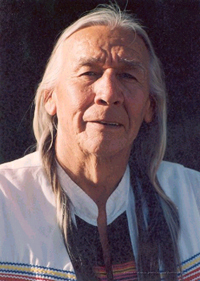 "Red Crow" in Dakota (August 17, 1936 – December 13, 2007), was a Sioux musician, political activist, and actor. After establishing a career as a country music singer, later in his life, he became a leading actor depicting Native Americans in American films and television. He is sometimes credited simply as Floyd Westerman. He worked as a political activist for Native American causes. He was born Floyd Westerman on the Lake Traverse Indian Reservation, home of the Sisseton Wahpeton Oyate, a federally recognized tribe. It is one of the tribes of the Eastern Dakota subgroup of the Great Sioux Nation, living within the U.S. state of South Dakota. His indigenous name Kanghi Duta means "Red Crow" in Dakota (one of the three Sioux related languages). At the age of 10, Westerman was sent to the Wahpeton Boarding School, where he first met Dennis Banks (who as an adult became a leader of the American Indian Movement). There Westerman and other boys were forced to cut their traditionally long hair and forbidden to speak their native languages. This experience would profoundly impact Westerman's later life. As an adult, he championed his own heritage. He graduated from Northern State University with a B.A. degree in secondary education. He served two years in the US Marines, before beginning his career as a singer. Before entering films and television, Westerman had established a solid reputation as a country-western music singer. His recordings offer a probing analysis of European influences in Native American communities. In addition to several solo recordings, Westerman collaborated with Jackson Browne, Willie Nelson, Bonnie Raitt, Harry Belafonte, Joni Mitchell, Kris Kristofferson, and Buffy Sainte-Marie. In the 1990s, he toured with Sting to raise funds to preserve rain forests. Westerman became interested in acting after years of performing as a singer. He debuted his film career in Renegades (1989), in which he played "Red Crow", the Lakota Sioux father of Hank Storm, the character played by Lou Diamond Phillips. Additional film roles include "Chief Ten Bears" in Dances with Wolves (1990), and the "shaman" for the singer Jim Morrison in Oliver Stone's The Doors (1991). Westerman appeared as Standing Elk, alongside his long-time friend Max Gail, in the family film, Tillamook Treasure (2006). He appeared in Hidalgo (2004), as Chief Eagle Horn in Buffalo Bill's circus. In September 2007, Westerman finished work for the film Swing Vote (2008). Television roles included playing "George" on Dharma & Greg, "Uncle Ray" on Walker, Texas Ranger (in the pilot and first regular seasons), "One Who Waits" on Northern Exposure, and multiple appearances as "Albert Hosteen" on The X-Files. Westerman died from complications of leukemia at Cedars-Sinai Medical Center in Los Angeles on December 13, 2007. He was surrounded by his wife Rosie and five children. ^ a b c d e f g h i Robert Jablon (December 16, 2007). "Floyd Red Crow Westerman, 71; Performer, activist". The Washington Post. Retrieved 2007-12-24. ^ Lockard, Vicki; Barry, Paul (June 3, 2000). "Indian Celebrity of the Year". Canku Ota - A Newsletter Celebrating Native America. Paul C. Barry. Archived from the original on 23 April 2006. Retrieved 1 August 2018. ^ Ford, Andréa (December 27, 2007). "Milestones – Died: "Floyd (Red Crow) Westerman". Time Magazine. Time Inc. Retrieved October 17, 2010. ^ Martin, Douglas (18 December 2017). "Floyd Red Crow Westerman, 71, an Actor, Is Dead". New York Times. The New York Times Company. p. C11. Retrieved 1 August 2018. ^ Carlson, Michael (24 December 2007). "Floyd Red Crow Westerman". The Guardian. Guardian News and Media Limited. Retrieved 1 August 2018. Associated Press (December 15, 2007). "American Indian activist, actor appeared in 'Dances With Wolves'". Los Angeles Times. Retrieved 2016-04-24.